Update: The Blocks smartwatch is now available for anyone to buy. See the latest details here. Blocks, the $330 Kickstarted modular smartwatch, is facing fresh delays and has been pushed back again from September to December 2016. That makes it six months late on its original shipping target of May this year - that's not unusual for a crowdfunded product but it is a shame for Blocks backers who have been waiting patiently for months, if not years. Below you'll find images of the final model, a video of a working smartwatch and details on shipping and non-Kickstarter pre-orders. Blocks is also nominated for Startup of the year in the Wareable Tech Awards 2016 - check out the full list of shortlists here. If you've been waiting since December 2013 to get 'the last smartwatch you'll need' (thanks to its swappable strap modules) on your wrist, here's what you need to know. When Blocks raised $1.6 million on Kickstarter, it was working towards a May 2016 shipping date. That has now been pushed back to December 2016 for Kickstarter backers. If you pre-order now from the Blocks website, you'll pay a new higher price of $330 and with the watch set to land in December. While over 5,000 backers wait, Blocks has released a video of a working smartwatch with a sleeker design than we've seen before and an intuitive looking UI (see above). There's a new stainless steel casing (in silver or gun metal black), Qualcomm's new wearable-focused processor and smaller individual Blocks modules to look forward to. The core Blocks smartwatch module runs on Android Marshmallow but is compatible with both iPhone and Android phones. We're told the functionality will be identical across both smartphone operating systems. The core module features a round, 1.4-inch colour 400 x 400 AMOLED display with Gorilla Glass 4.0, Qualcomm's low power Snapdragon Wear 2100 processor and a 300mAh battery which Blocks says is good for 1.5 days of battery. Further display modules including a rectangular smartwatch screen will be available in the future but there's no timeline on this yet. There's 4GB of memory plus 512MB of RAM as well as Bluetooth 4.1 LE, Wi-Fi and sensors for activity tracking including a 9-axis accelerometer, gyroscope and magnetometer. There's also a microphone for voice controls, a vibration motor for haptic alerts and a power button. The exterior of the core module is a stainless steel casing, we don't have the dimensions yet. The extra Blocks modules are made from polycarbonate and their maximum dimensions are: 25 x 31 x 8mm. Now this is where things get really interesting. Blocks has more than 1,500 developers who have signed up to make apps for the individual, electronic modules that make up the strap of the modular smartwatch. These can be swapped in and out in seconds and even at this early stage there's much more choice in terms of function than your average smartwatch. These were available as part of the Kickstarter package and in time will be purchased via the BLOCKStore, which should launch in time for shipping in the autumn. The first modules that are available are an extra battery module, offering 20% extra juice, a heart rate monitoring module and a GPS module. If you pre-order now, you can also choose from an 'adventure' module which tracks altitude, temperature and pressure as well as a programmable button to trigger smartphone actions and a flashlight module with a white LED light. The new pre-order price for one core display module and four additional Blocks modules is $330 direct from Blocks. The Kickstarter price was $285 for the same deal. Backers chose modules and colour preferences after the campaign ended. Blocks will be available in three colour options - white, black and red. Anyone with smaller wrists (less than 150mm circumference) can simply take one of the Blocks modules out of the wristband. According to the Kickstarter page, most users will be able to wear four modules as the band but anyone with particularly large wrists can order an extra module. The cheapest super early bird price was $250 for one core and four Blocks with just 500 of these available. This rose to the early bird prices of $260 and $275 with 1,000 units each available at these prices. A Blocks core and a standard strap was also available for $195 - modules can be added later for $30 each if you chose this option. A limited edition Blocks smartwatch, engraved and with a personalised watch face was going for $445. Blocks smartwatch: Should you pre-order? Assuming you didn't get one of the good Kickstarter deals, should you spend $330 on this modular smartwatch? From a purely practical point of view, Blocks could be exactly what you've been waiting for. A watch that you can stick a SIM module in when you want to leave your phone at home. A tracker that you can take the GPS module out of when you don't need it and you'd prefer extra battery. There really is - still - nothing like this. That said, there will no doubt be a few niggles in backers' minds. It's still not the most stylish looking smartwatch from the press images though we'll have to see the final consumer model in person to really make up our minds. It also looks quite chunky - we don't yet have the exact thickness yet. There's also that wait - if you pre-order a Blocks now, you'll be waiting until December 2016 for it to ship. Not to mention there's no guarantee that those 1,500 developers will get apps created in time for the launch, or ever. 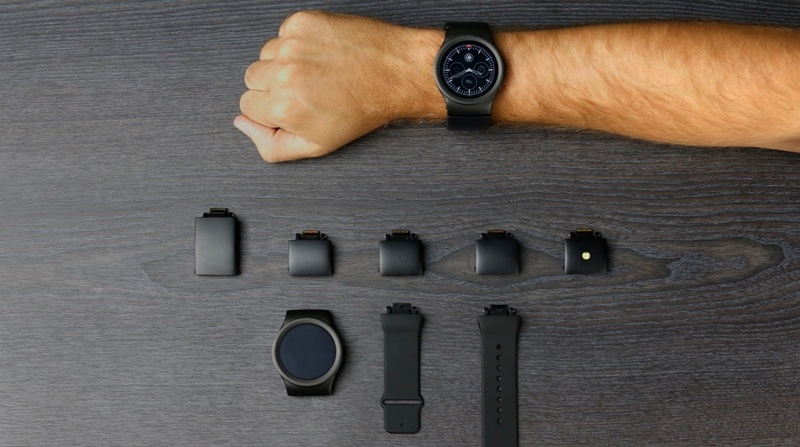 Just look at the overdue Pebble Smartstraps as an example of a brilliant - modular - concept that hasn't quite materialised despite a $1 million fund. No matter what you choose, though, one thing is for certain - Blocks is making good on its original promise to build the Project Ara of wearable tech, a modular, swappable, upgradeable smartwatch. The rest of the industry should take note - it can be done.